Established in 2006 through a generous gift of Jeanne and Will M. Caldwell to the College of LSA, first- and second-year students of the Lloyd Hall Scholars Program compete for poetry prizes, which are awarded each year. 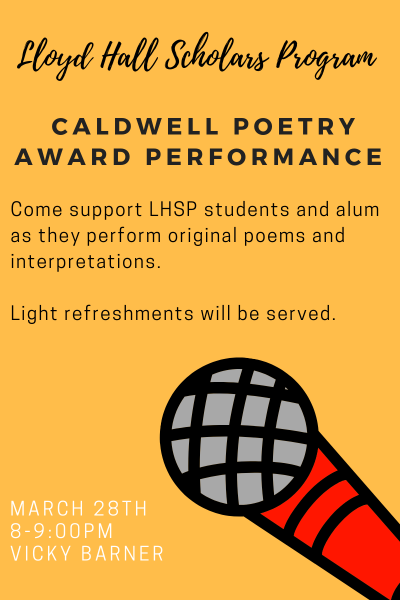 One category within the Caldwell Poetry Award is recitation. Students perform an original work or an oral interpretation of another poet's work for a committee of faculty and student judges. The winners will be announced later at the LHSP End of Year Festival (April 17). The whole LHSP community is invited to come enjoy this night of poetry and support the students who are performing.